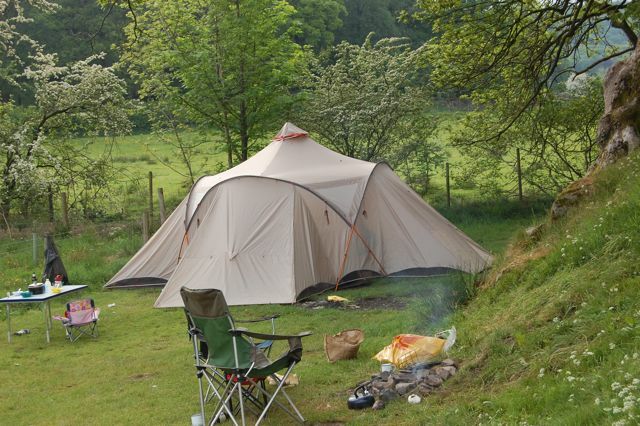 At campsites and festivals, we get inquiries about our tent, the Vaude Badawi II. 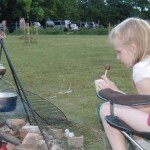 When it appeared in the background on the BBC camping documentary Britain Goes Camping, Mumsnet lit up with curiosity. The sand-coloured Vaude Badawi II is a pyramid rising to a ventilated apex, with three bedrooms sloping off the sides. The designer Tommi Langowski was inspired by the old pyramid tents used by expeditions. He improved this classic design by removing the central pole and replacing it with an ingenious four-legged spider pole that provides supportive ribbing for the roof. As a result, the living heart of the tent is roomy, high and uninterrupted. Unlike the big family tunnel tents, the bedrooms are low-ceilinged and modest which makes them much warmer if you are camping out of summer season. Sleeping in the inner tent is like being in a small two-men tent. Step out into the living area and there is plenty of well-ventilated living space. The groundsheet and fly sheet are not stitched together, leaving a gap of about two inches between the grass and the bottom of the fly sheet. 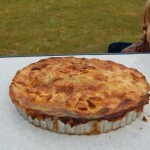 As long as you peg the fly sheet so that rain runs straight off the tent and into the ground, the interior remains dry. I prefer not having an integral groundsheet: the tent is less likely to rip and the air circulates freely so that even on a scorching morning, the interior remains cool. I cannot pitch that little hat properly, but it does its job. The Vaude Badawi II weighs just shy of twenty kilos and we use it to sleep three children and two adults. 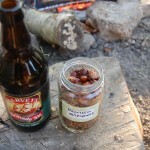 Over two years, we have taken it out about twenty-six times, to tiny campsites and festivals. The only flaw is the little rain hat that balances upon the apex of the tent, which is effective but almost impossible to pitch tidily or with any dignity. Vaude’s website, as of 2011, lists just the Badawi and the Badawi Long as current tents, but the Badawi II is still available. Hello, I’ve just bought a Vaude Badawi II – haven’t used it yet, but did read your review which helped me to make up my mind that I wanted it, so thanks! I expect you’ve worked it out by now – but I noticed your little hat wasn’t quite right in the photo, you have to stretch the orange rim of the hat around the bendy circular poles. Did you buy the optional 3rd bedroom with it? I don’t know if it’s still available to buy – mine didn’t come with it. I hope the tent treats you well. I am pleased that the review helped you decide which tent to get, but will also feel faintly responsible if it lets you down. (It has never let me down). We did buy the third bedroom to accomodate the brood. As for the little hat, I know how it is meant to fit, but whether it will stay in position or not is another matter. We loosely peg out a footprint and then put the band around those loosely inserted pegs. And then the tent – as you say – tensions it into shape. My hands have more knowledge than my head when it comes to this tent. I have never used the little string in the bedrooms. The little hat is a lost cause as far as I am concerned, but I have never experienced any problems as a consequence of its ungainly, jaunty angle. Let us know if the tent treats you well out and about in the field. Well, not counting a one-nighter in rainy Clitheroe, its first outing will be a delightful blues festival near Chichester, which in the 12 years of my going, has always been a scorcher, so Vaude’s lauded ventilation system should be put to the test. Wonder if it will attract comments like you’ve experienced …. Hello again. 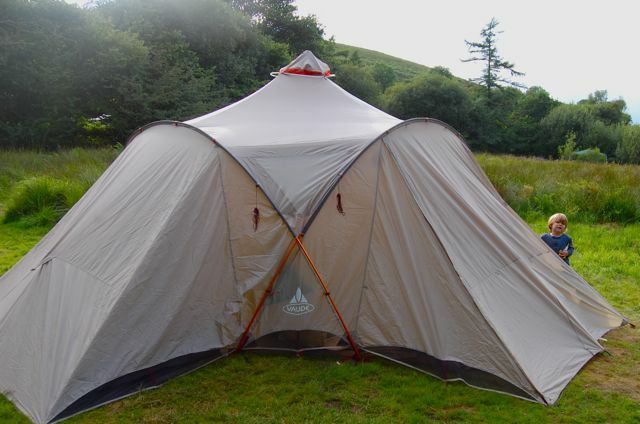 Well, having been on 2 camping trips with my new badawi, I have a few more queries which I hope you don’t mind helping me with … the bedrooms; I can’t seem to install them without the back wall touching the outer tent, thus letting in rain, are you supposed to peg the three back loops together with the main fly sheet, or should they be pegged separately slightly further in? And the front clips I assume hook under the poles along with the main tent hooks? It just didn’t seem to look right, the base of the bedrooms weren’t stretched out enough. At one point I thought the front hooks of the bedrooms went into the metal rings on the setting-up band, but that didn’t work … which made me wonder what they were actually for? And finally, on the front door there are buttons half way up .. is this so you can secure the door open at a lower level for children to run in and out? 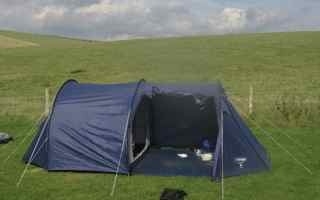 Otherwise, it’s a superb tent – so roomy and light. 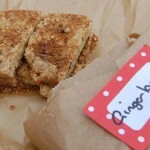 And it did attract comments at the festival I went to! The flippin’ hat thing pops out every time though…grrr. Hi Nina, I’ve put the tent up so many times now it’s automatic so I’m trying to envisage what I do. First off I make sure the fly sheet is taut and fully pegged out, then I clip the back edge of the bedrooms to the pegs I used for the flysheet. I hook the front pegs onto the silver metal rings of the inner band, which do get a bit cluttered. 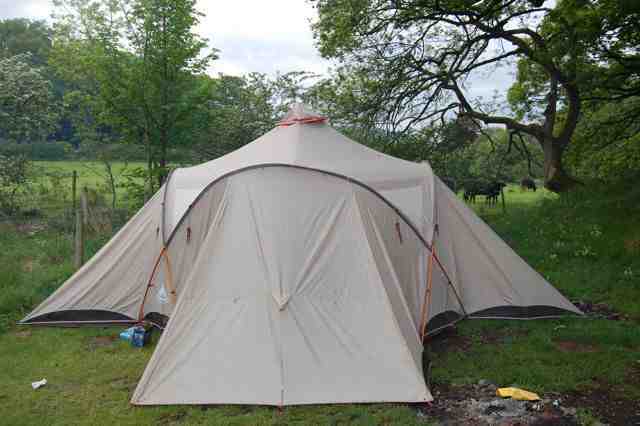 I really make use of the tension straps to make the groundsheets and inner tents taut. I haven’t fiddled about with the doors much, we mainly unzip one side and use that, unless it’s roasting hot in which case we open the front fully, but I’ll have a look next time I’m in in. We ca never get the hat to stay on either. We’ve just been to Glastonbury with it and the rain was the main topic of conversation and thankfully we didn’t get any leaks. Wow, what a nightmare. If all tents where like this one no one would go camping. When it comes to pitching being simple (the tent not me) always wins the day. I know they are a bit expensive but in my humble view North Face tents are worth the investment. Easy to put up, as strong as they come and a reasonable weight (just like me). that looks like a rediculas tent. any tent should be easy to pich, cant see that one being up in less than ten minutes – and as it looks like a single skin, if the ground sheet is not attached i wouldn’t trust it to keep the elements out. Dont know the cost but if there’s a “designer” attached recon you could get much better for your money. I’m not going to persuade you one way or the other. But I’m sticking with this tent. I’ve noticed all the niggles you mentioned. On a recent camp in the Highlands in Easter, the weather was very wet but we coped in this tent. Which brings me to my first point. This is true and the most serious design fault in it. It becomes more apparent over time as the flysheet begins to sag at these points and the water pools. I bought some extra waterproofing spray and treated those seams when we were last camping in the Highlands. It improved matters for a night or two. Will see if it keeps. I don’t suffer from this too much because I only camp where there is a campfire, and I’ve acquired a tarp for us to sit under around the fire when it rains. I was sent a lovely lightweight tarp and I’ve set myself the task of learning the best way to attach one. It’s more improvisatory than a tent. Regardless of which tent i owned, I would still use a tarp for sitting out under (at a safe distance from the tent) and cooking under in the rain. A little bit, with the front zips. I think this might be true of most tents. The rain should always run off the flysheet straight into the ground. There is some spattering. I’ve been very glad of these gaps when it is hot. Thanks. Haven’t tried waterproofing spray, so will do that. Good idea to set up a tarp away from main tent. I was wondering if you’d bought the comfort footprint for the Badawi? I’ve seen one on the German eBay and am considering getting one before they become obsolete. From what I gather, they attach to the toggles part way up the sides of the main fly thereby sealing you in. Thanks.